The first car to ever receive a speeding ticket was pulled over for travelling at a heady 8mph – which was four times the speed limit at the time. 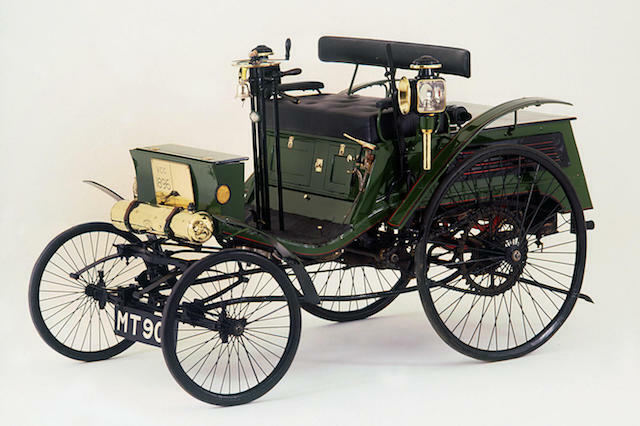 Walter Arnold was driving his 1896 Arnold Benz Motor Carriage through Paddock Green in Kent, when he was spotted by a police officer. Rather comically, the officer then gave pursuit on his bicycle, before pulling Arnold over and fined him a shilling plus costs – which is believed to be the first speeding conviction in history. Under the law at the time, motor cars were banned from travelling faster than 2mph, and drivers were required to have another person walk in front of the car while waving a red flag. However, later in 1896, the Locomotive Act was introduced, which did away with the need for the flag bearer and raised the speed limit to 14mph. To welcome in the law change, car owners – including Arnold – organised an 'Emancipation Run' that saw drivers travel from London to Brighton. The same classic rally takes place to this day in the form of the famed Royal Automobile Club's Veteran Car Run, which is open to pre-1905 motor cars. Arnold's infamous car is set to appear at this year's Concours of Elegance, which will be held at Hampton Court Palace in September, along with a parade of early motor cars. Joining these pioneering vehicles will be a number of completely different beasts – including the Le Mans-winning Jaguar XJR-9 and the Harrods-livered McLaren F1 GTR. Both of these famous racers can reach top speeds in excess of 240mph – a far cry from the 8mph speed that got Arnold in trouble back in 1896.